Research on affect and exercise has typically involved the measurement of affect with self-report instruments, although human emotion has been estimated using psychophysiological and observational techniques. Chemicals sensitize and activate type IV polymodal nociceptors. Polymodal nociceptors respond to painfully hot and cold temperatures as well as a host of chemical stimuli that activate the nociceptive afferents. Characteristics of the target group, such as age, living situation, and income, should be considered in selecting interventions. Exercise Psychology, Second Edition, provides an in-depth examination of the psychological antecedents and consequences of physical activity. This edition offers new and thoroughly updated chapters as well as an image bank, which serves as a valuable resource for lecture preparation. 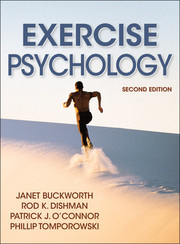 Authors Buckworth and Dishman, along with newly added authors O'Connor and Tomporowski,bring subject area expertise to the book and provide an in-depth examination of the relationships between exercise and psychological constructs. The findings on both classic and cutting-edge topics are clearly and cohesively presented with the help of relevant quotes, sidebars, suggested readings, and a glossary to guide students through their studies. Textbook for graduate and upper-level undergraduate courses in exercise psychology and other similar courses in fitness or health psychology; reference for academic libraries and researchers in kinesiology and psychology.